Pre-registration highly recommended. Walk-ins upon availability. 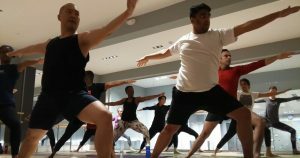 Description: This vinyasa flow class is appropriate for all levels. Emphasis is placed on organic movement with mindful alignment principles for safety. Be ready to sweat as we transition through different poses to create a fluid sequence of poses. The class is dynamic to complement strength with flexibility. This will be challenging but accessible by all practitioners.